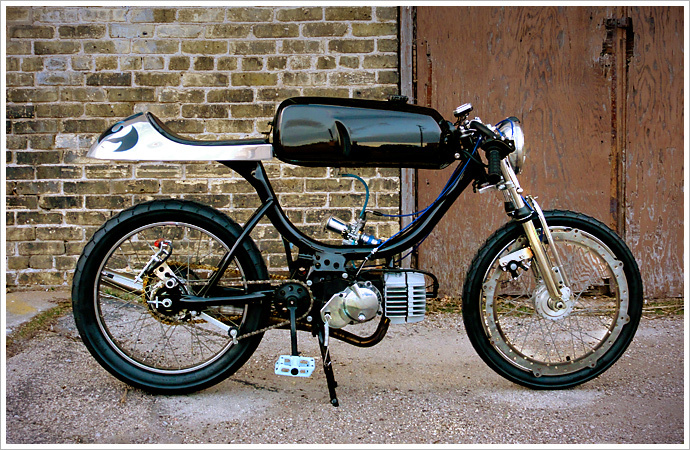 “After getting into vintage pedal start mopeds a short two years ago, I set out to build a one-off, café inspired moped that challenged me, and my abilities as a welder, fabricator and painter. My goal was to do as much of the build independently as I could, with the limited tools available. “The Baby Maker” project is the result of that push to build the best bike that I could, prior to our wonderful twins being born. I started with a 1978 J.C. Penny Pinto moped that I traded a buddy for. After a complete tear down of the bike and motor, I sand blasted everything at a coworker’s countryside shop. Almost all the welding and fabrication was completed at another coworker’s home garage. 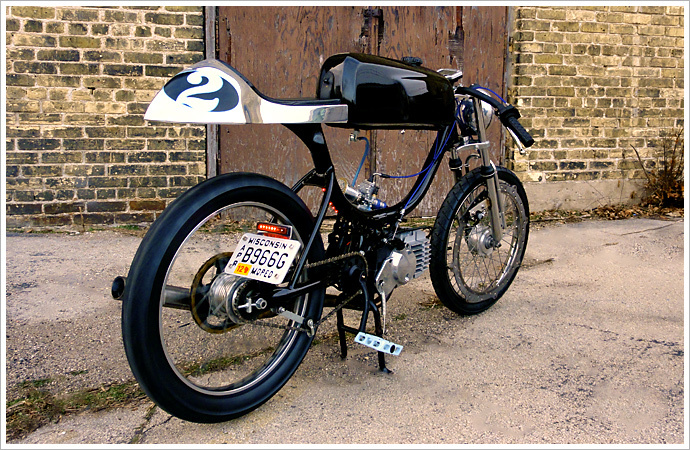 “With the seat and tank mounted, the bike got tore back down and prepped for bodywork and paint, which I completed in my garage. I was pleased with how the paint turned out, considering the black was Rustoleum spray paint covered with a nice smooth layer of urethane clear coat. However, the spray bomb would not be used the next time I do a project of this magnitude. 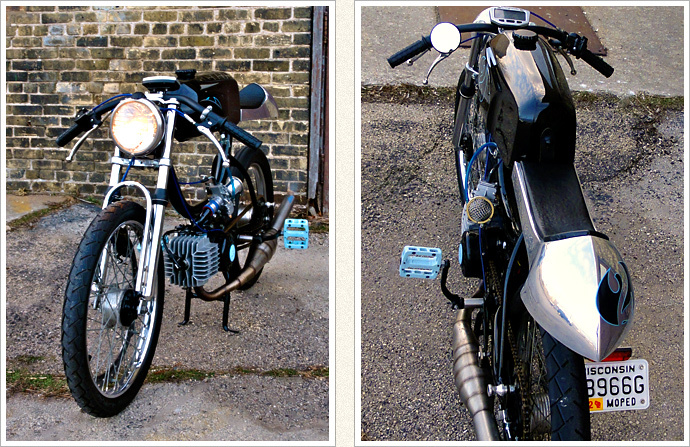 “While the paint was drying, the motor rebuild started in my basement. With a clean set of cases, I bored them out and case matched them to fit the 74 cc Gilardoni cylinder kit, high temp paint was applied and cured using my charcoal grill. Being a one speed, low cc motor, I wanted to get as much power out of it as I could. I took the main gear and drilled and countersunk over a hundred holes in order to reduce the rotational mass. I paired my lightened gear with a lightened clutch basket and three-shoe clutch. This combination allows the engine to get into the power band of the handmade stainless pipe built by Motion Left Mopeds. A new crank fitted with fresh bearings and seals was set into the cases and everything was sealed and bolted back together. A Mikuni TM24 was bolted to a custom made intake. For spark, I used a points set up with internal coil and 12v lighting. After sanding, shaving and polishing the clutch cover, I also gave the flywheel cover the drilled out treatment. A small blue stripe was painted on the blacked out flywheel, so as the motor turns, you can see the stripe rotate through the holes in the cover. A nice little touch you don’t see everyday. “The final touches included the controls, Trailtech digital speedo, and of course the custom number 2 race numbers arranged in an asymmetric manner on the tank and seat. The inspiration for the numbers was influenced by my wife’s pregnancy, with twins, shortly after starting this build. 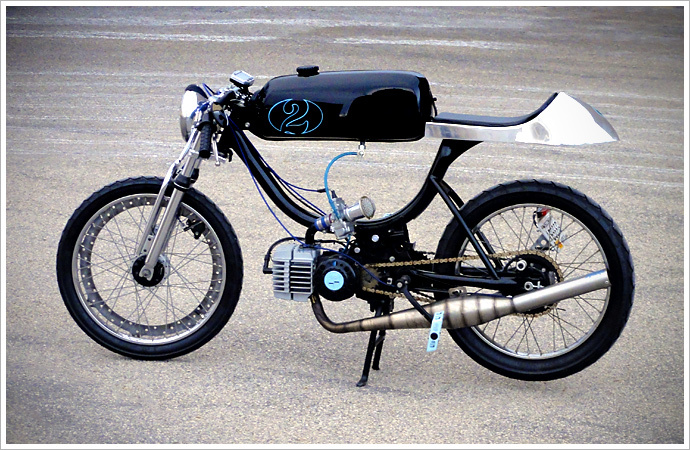 The irony is, this sweet little moped named ‘the baby maker’ actually took Nicholas nine months to build. You know what else takes nine months to come to life? Yep, we couldn’t have written a better ending to the story -unless of course the twins grow up to be ‘Shinya Kimura’ style bike builders and dedicate their careers to Pipeburn. We’ll keep you posted. 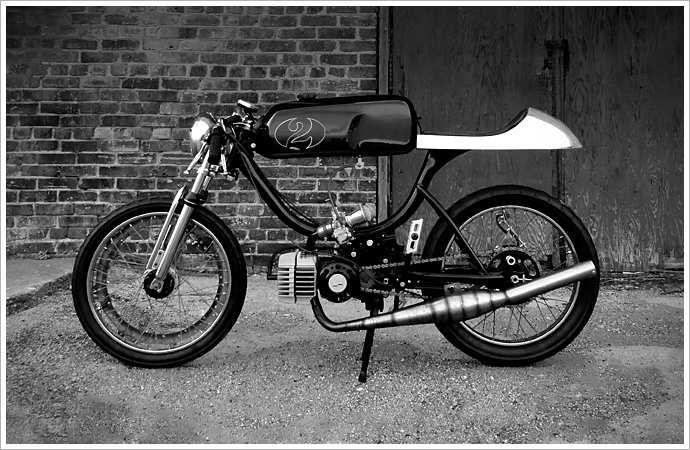 For more on this build check out the thread on moped army. PS. Your arsecakes deserve the best. Check out our range of Nitroheads Seats in the Pipeburn store.